This entry was posted on Monday, April 1st, 2013 by Frances Ryan. I have been scouring the Internet for weeks looking for kooky ways to find the money. And I’ll tell you, if I didn’t already have kidney disease I’d sell one of them. Yes, I’m desperate! But then my sister-in-law mentioned game shows. She and her partner are regular viewers and are certain that I would be really good on them. I don’t actually like the idea of going on television, but I decided I needed to look into it. And that’s when I found an application for a reality show being run by Richard Branson and Virgin Media. But the grand prize is £100,000, so I applied. And I have been accepted to join the cast. 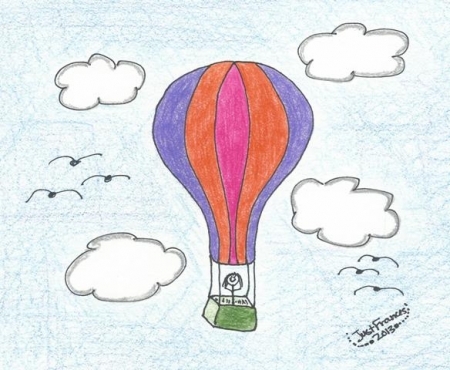 Which means that, beginning June 1, 2013, I will be traipsing across the Atlantic in a hot air balloon with 15 other contestants. Yes, you read that right: I will be hot air ballooning across the Atlantic. We start off in four balloons, with a ‘sea crew’ following us on big ships so that we can land in the evenings for a hot meal and safe bed. As balloonists are evicted, they will continue the journey to New York on the ship. Eventually, one balloon and two contestants will remain. I don’t know what kind of elimination contests there will be or what kind of set up they’ll have for determining who/when/where evictions will take place, and I don’t imagine I will know until I get to London for the pre-take-off orientation and training. Oh! And no phones. No Facebook. No Just Frances. Oh, the horror of it all! Plus that, it’s a free ride to the States where I was planning on heading in June anyhow! Stay tuned for details on broadcast dates—and my nervous preparation for what is certainly an insane little adventure!